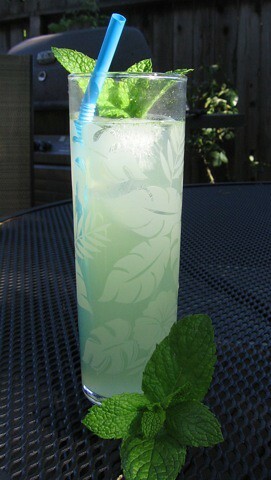 In a tall collins glass, muddle mint leaves, sugar and lime juice. Add rum. Add ice. Top with soda. Stir. Add straw and mint sprig. Okay, the first question. What rum? Recipes vary. If the good folks at Bacardi are to be believed, it should be Bacardi (what a long shot there). I personally think a medium bodied rum adds that little complexity that’s needed–maybe an Appelton Estates or a Bacardi select. Probably something really dark and spiced would be too much. Brenda really seems to think Bacardi silver is the way to go. Her view, the more refreshing, the better. Something to be said for that. This drink really is a strong contender for the drink that IS summer. The second issue is how to assemble it, and the follow up of what glasses. This one is pretty much my arena. I think if you want this drink to come out right, you have to use bar sugar and the mint leaves (and I add these by themselves first) and muddle them good. When I’m done, it’s a green ooze of mint goo. I then add the lime juice and muddle a little more. Finally, I add the rum and let it sit for a minute or two. My thought is to let the alcohol do a bit of extracting from the mint leaves. Finally add the ice, seltzer and sundry drink toys. This all leaves us with a bit of a problem–mushed up mint leaves. If you put this in a clear glass, it’s not a pretty drink. So, option 1) really cool tiki mugs. The drink really isn’t tiki (wrong ocean), but it is tropical and if you have cool tiki, why not. Option 2). Muddle as before, but this time do it in a measuring cup. It’s easier to muddle in the shorter cup anyway. After the rum has had time to sit, put ice in tall collins glasses (ours have hibiscus flowers on them). Strain the muddled mix through one of those fine mesh tea strainers. Squirt a little of the seltzer through to rinse the mint leaves. Finish up by topping off with seltzer. This has the advantage of a prettier drink and no mint leaves in your teeth. The taste does seem to be the same. So is bar sugar different from normal sugar? I do love a Mojito! Bar sugar is just super fine sugar (also known as castor sugar or caster sugar). It’s different than powdered/icing/confectioners sugar. You can make it by putting regular table sugar in a food processor and pulsing it a bit. I like it because it is still granular enough to help muddle the mint leaves but fine enough to dissolve easily afterwards.